The first place to start when thinking about the online church and its impact is to understand how big it is and where it fits within the ministries of your church. Vanderbloemen, an executive search firm that helps churches find their key staff, and Jay Kranda, an online pastor and online ministry thought leader, partnered on The State of the Online Church study in 2018, which was the largest study done on trends and best practices for the online church. 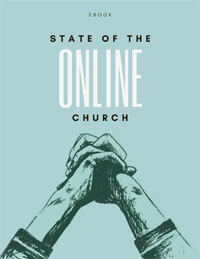 In February, they released The State of the Online Church, an ebook that reveals the findings of the 2018 survey and shows how churches measure online attendance, how many people are watching, where they are watching from, and how to bring measurable data to your own discussions of the value and impact of the online church. Who Is Attending Church Online? 42% of churches saw their online attendance consisting of people living in a reasonable driving distance of their church. 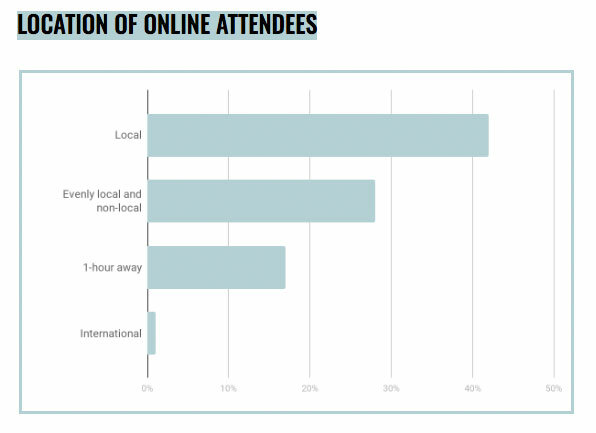 28% saw online attendance evenly mixed of local and non-local. 17% saw attendance of people who live one hour away from their church. This is a huge local outreach opportunity. As the presence of an online church grows and people continue to build community, an online church can transition to another physical campus, or continue to exist as an accessible and relational option for anyone who is curious about church. It’s also a great way for the heart of a physical church to extend further into the community. An online church community group serving together in a ministry close to the heart of the physical church is one example of what the physical church is all about. It’s a great picture of the gospel that non believers will notice. 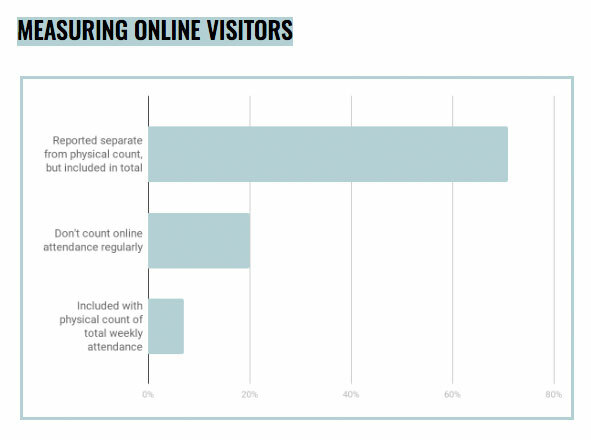 How Are Churches Measuring Online Attendance? 72% of churches report online attendance weekly and separate from their physical attendance. When asked how they measure online church attendance, 26% of respondents said “concurrent streamers at a given time,” which was the highest response to that individual question. 21% of respondents said “other” when asked how they measure online attendance, which was the second highest response to that individual question. There was little consistency in how churches track online attendance. Remember this when someone tells you how large their online attendance is. It’s important to ask how they are measuring it and why. Keep in mind that in measuring attendance, you don’t just want to know how many people are attending, you also want to know who is attending. Knowing who is watching online services will help you tailor an experience for watchers that will help retain them, as well as reach people no one else is. In 2015, the Pew Research Center reported that under the Protestant umbrella, nearly 42% of Americans are in a religious identity different from the one in which they were raised. In a changing religious landscape in America today, stepping foot inside the doors of a physical church may be intimidating, painful, or awkward for some. But the anonymity of an online service—or even the support of an online community where there is as much or as little involvement and face-to-face interaction as desired—could open doors for the questioning, the doubting, the unsure, and the curious to hear the gospel. If you’re exploring what your church’s online church strategy should be, download The State of the Online Church ebook, a resource by Vanderbloemen, Pushpay, and JayKranda.com. Need more help with online church? Our Courageous Storytellers membership site has an entire month’s worth of content focused on digital church, including live video solutions, podcasting on a budget, how to offer online sacraments, and more. Check out Courageous Storytellers for more helpful resources. Holly Tate is the vice president of marketing at Vanderbloemen, an executive search firm that helps churches and faith-based organizations find their key staff. Connect with Holly on Twitter. Read more posts by Holly Tate | Want to write for us?